Meticulous and uncompromising are the culinary watchwords guiding the professional life of Paul Pisa, executive chef at Quinn’s Steakhouse & Irish Bar and sister establishments, The Irish Embassy Pub & Grill and P.J. O’Brien Irish Pub & Restaurant. These attributes speak to a passion for excellence carefully nurtured from his early apprenticeships and rise at many of Toronto’s acclaimed restaurants. Now the creative force in three great kitchens, Paul Pisa is recognized as one of the city’s most respected executive chefs. Drawing from a career working at the cutting-edge of the culinary arts, Chef Paul expertly guides a hand-picked team of top chefs as they make their indelible imprint on a cuisine unmatched for its inventive flair, freshness and delightful spectrum of awe-inspiring tastes. 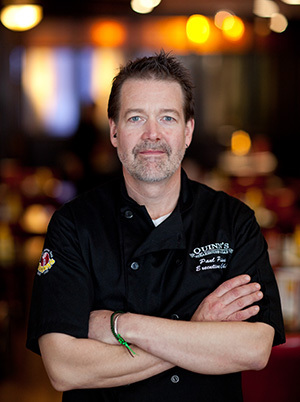 Although winning accolades for his gifted interpretations of a variety of styles – from haute cuisine to rustic pub fare, trend-setting gourmet to the fusion arts– Chef Paul remains grounded in a personal commitment to featuring the most nutritious and healthful dishes his kitchens can prepare. At his Irish Embassy restaurants, these extremely dynamic and flavourful creations are showcased in an enchanting marriage between Ireland’s wholesome “garden-to-table” culinary heritage and the very latest in Canadian resto chic. Just to set the table, Nova Scotia lobster and Quebec duck make their delectable mark alongside lamb shank braised in Irish Guinness stout and a breathtaking variety of the finest AAA steaks. On the side, all are complemented by fresh salads and appetizers -such as tuna tataki, charcuterie and duck liver pate brulee… or, perhaps, an intriguing prawn martini. Whatever your palate, Chef Paul and his team are sure to surprise, if not enthrall, with a gastronomic table of unequalled quality and taste that will accept no compromise. Only the best from the very best.